KONG Stretchezz Tugga is a challenging stuffed animal toy for dogs. An elastic rope is hidden between the head and body of this cuddly toy. This makes it fun to pull on the toy. 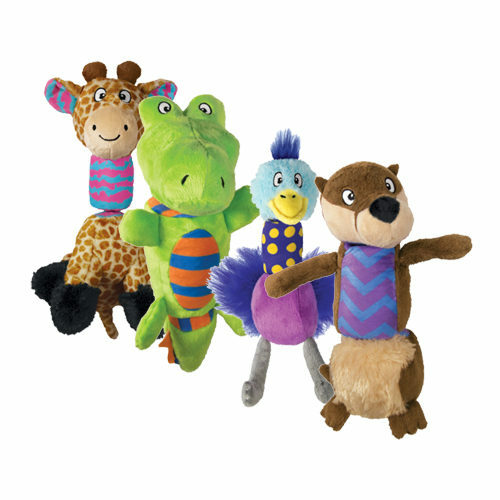 This plush animal dangles in all directions! The fun squeakers in the toy enhance the enjoyment. KONG Stretchezz Tugga are fun stuffed animal toys for your dog. An elastic rope is hidden between the head and body of the toy. These toys are even more fun for interactive playing with your dog thanks to the added rope. The toy can dangle in all directions and has fun squeakers! Have you used KONG Stretchezz Tugga before? Let us know what you think about this product.